As you know, ordinary elytra wings will work if you jump from a great height. In that case, your height will decrease until you fall to the ground. 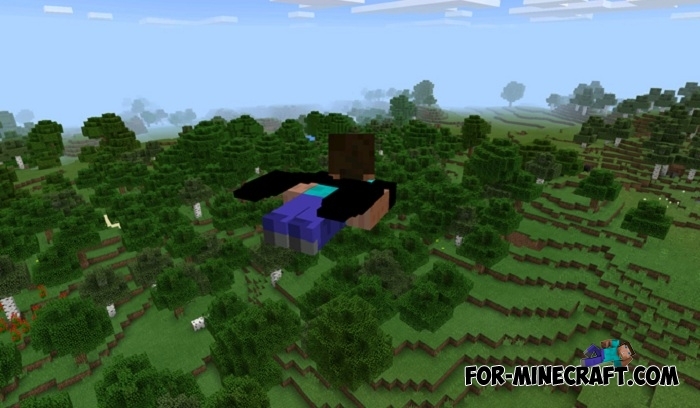 But by installing the Upgraded Elytra mod you can use the wings anywhere at any height. Forget about jetpacks requiring fuel, updated wings can take you anywhere in your world. Put new wings and jump from a small height (about 3 blocks). You will fly to the direction in which you are looking. The flight speed is quite high, because of which some devices can work incorrectly causing lags. Loading the world is slower if you have less than 1 GB of RAM. Just smoothly land on the ground, it does not do damage that is a useful difference from other vehicles. I almost forgot, you can change the appearance of the wings at any time with the help of the already ready pack - More Elytra mod for Minecraft PE. Download it and select the one you want. The Upgraded Elytra mod works only on MCPE version 1.0.